Captain America: Civil War is an awesome movie, and now you have the chance to add it to your collection for FREE! 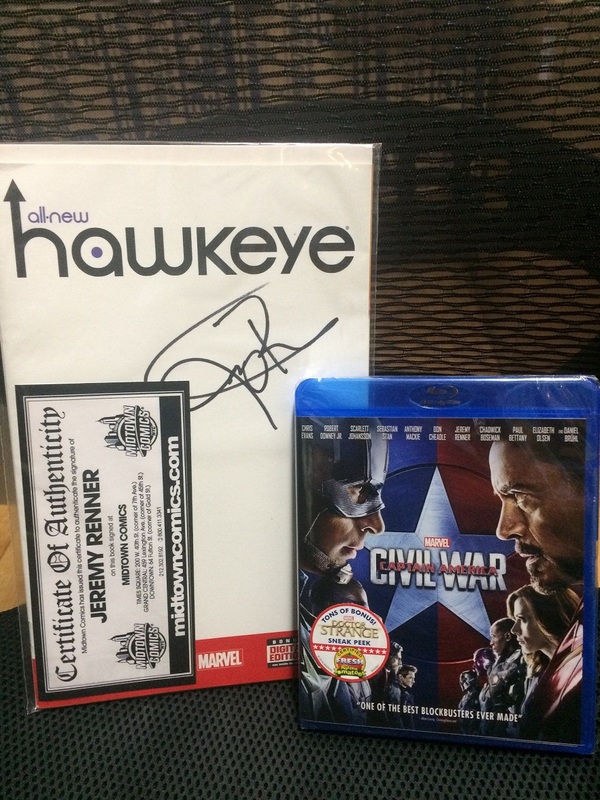 Two lucky Marvel fans will get the Blu-ray/DVD, and one VERY lucky True Believer will get the movie AND a copy of All-New Hawkeye #1 signed by Jeremy Renner, aka the Marvel Cinematic Universe’s Clint Barton/Hawkeye! You don’t need to get into a superhero brawl or make a ridiculously difficult shot with a bow and arrow to win this phenomenal prize. All you have to do is enter the raffle below. Contest is for U.S. residents only (excluding Hawaii, Alaska, and Puerto Rico); winner will be contacted via the email they use in the raffle. Good luck! Captain America: Civil War is now in theaters, and we think it was all kinds of awesome! You can watch our video review HERE and listen to our podcast review HERE – both are spoiler-free, of course! Now, NYC area fans have the chance to watch the film in 4DX this weekend at the Regal Cinemas in Times Square… for free! We’re giving away TWO PAIRS of tickets to a showing on Sunday (5/8). The raffle is TODAY ONLY, so make sure you enter asap!